Paraguay is on a mission to become an epicentre of logistics in its part of South America. Its location, economic growth and plentiful waterways all point to the country being able to achieve this goal. Paraguay occupies a highly advantageous position in the Southern Cone, sharing borders with the first and third most important economies of Latin America, Brazil and Argentina, as well as with Bolivia, which alongside Paraguay had the highest annual GDP growth in 2017 in the region. In addition, the country is rich in natural resources,the cost of its electricity is low, it has a young workforce, and most importantly, it has important waterways that can be utilised for the transportation of goods. Paraguay enjoys a competitive advantage over its neighbours with its costs of production and cargo storage, and intends to exploit these advantages to become the most important logistics centre in the region. Although this is a significant challenge for the country, it is already on its way to achieving its goal. The strategic introduction of the government’s new National Logistics Plan and National Transport Plan has been an important contributor to this. Both these programmes have access to budgets that should see them completed, despite the magnitude of their ambition. Paraguay’s overland transportation infrastructure includes a road network covering 87,197km, 6.3% of which is surfaced, 2.9% covered with gravel and 90.8% with earth. Paraguay enjoys a competitive advantage over its neighbours with its costs of production and cargo storage, and intends to exploit these advantages. These roads are used to transport goods to the country’s ports (Asunción, Ciudad del Este and Encarnación) and the main border crossings (Villeta, Salto del Guairá, Pilar and Pedro Juan Caballero) for foreign trade. The most important transport infrastructure overall is undoubtedly the hidrovía formed by the rivers Paraná and Paraguay. It represents one of the keys to South American integration, according to the Organisation of American States. 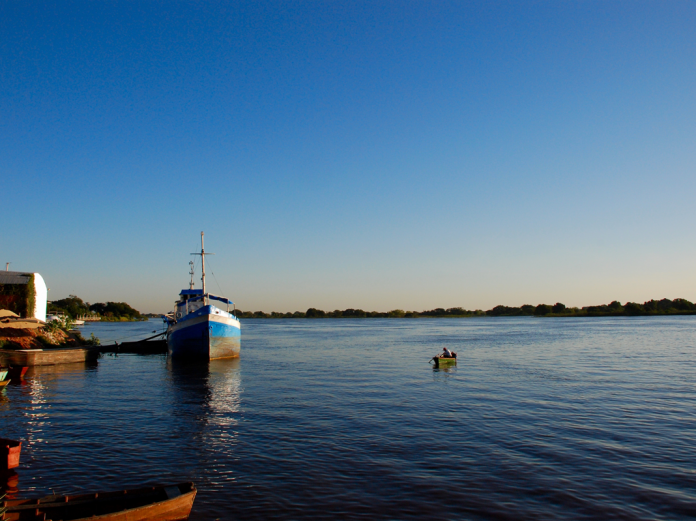 The waterway connects Brazil, Argentina, Bolivia, Uruguay and Paraguay through a shared river system that runs for 3,442km, and is an important part of life for some 30 million people in an area of 700,000km2. This route has been used since colonial times, but it was only in the 1980s that a growth in agricultural prosperity motivated all the countries to start integrating and standardising their regulations. Today the hidrovía is used to transport 70-75% of all Paraguay’s imports and exports. A good reason for this is that the cost of transporting goods, which are priced according to volume, is much less by river than by land, leaving no doubt as to how the customer at the end of the line benefits. The growth in the transportation of goods by river has been so extensive that the amount of cargo increased from 700,000 tonnes to over 17 million tonnes per year between 1988 and 2010. One of the biggest current challenges for the country’s waterway system is reducing delivery times, and this is being addressed in various ways. One example of such evolution is the company Terminales y Logística Portuaria (TLP), one of the most established firms in the sector, which has a port and transportation network, and which transports approximately 40,000m3 of imported oil derivatives a month and 6,000 tonnes of vegetable oils for export. Agricultural products such as beef, cereals, soya, flour, oil, coffee, as well as pellets, minerals and fuels are transported in a convoy of huge barges measuring 300m long, 46m wide and with a below water depth of approximately 3m, using tugs for assistance. Storage is available for different goods according to their requirements and to the logistical and commercial demands of the customer. One company that stands out in the storage market is ALMASOL, which owns 80,000m2 of industrial and logistical facilities, and specialises in developing commercial premises to meet the needs of its clients. By being able to adapt its designs it can guarantee the ability to meet predetermined objectives with the optimisation of its operational processes. One of the biggest current challenges for the country’s waterway system is reducing delivery times, and this is being addressed in various ways, including the introduction of signalling systems to improve the efficiency of navigation at night, which cuts the journey from 19 to just nine7 days from the port in Cáceres, Brazil to the Nueva Palmira port in Uruguay. With the development of logistics experiencing a general boom, the Latin American Development Bank is offering foreign companies substantial opportunities to invest in projects such as improving the principal waterways between Ciudad de Este and Encarnación, and from Asunción to Ciudad del Este, as well as in developing large agribusiness logistics centres, increasing river traffic to fully exploit the hidrovía’s potential and constructing the Bioceánico railway that will connect Brazil and Chile.